We are proud to announce that you can now download our podcast and follow the Java PDF Podcasts on ITUNES which you can access from here. Close followers of the Java PDF Blog may know about our Java PDF Podcast show. 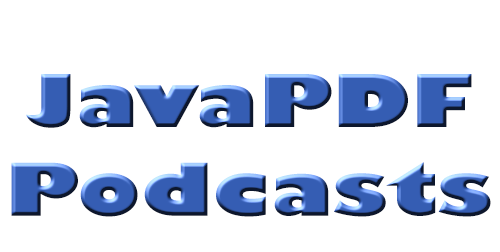 However if you are new to the Java PDF Blog you may not know what it these Podcasts are about. 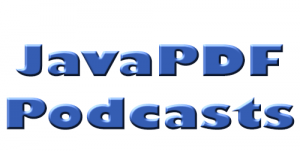 So..what is Java PDF Podcast? In our Podcast we share lots of interesting information about lots of things related to Java, PDF and HTML5 on the Java PDF blog. These series of podcasts are at least 5-7 minute in length and are a good way of discussing news and updating our customers on what we are working on and a chance to meet our team. We try to record a Podcast whenever we think we have something interesting to report on. So when we go to JavaOne we try to give you the news and a feeling of what it is like to be part of it (so if you want to get our report on javaOne2014, you might want to sign up now). Where can I listen to it? Previously on Java PDF Podcast………. We have already covered a number of topics in the Java PDF Podcast. You can find these topics listed below, where you will also find the direct download. Hopefully you will have found these Podcasts an interesting listening, keep a watch on the Java PDF Blog for new Podcast coming soon.